This pudding is closely related to carrot cake, which is often called passion cake. Served with the vanilla mascarpone sauce melting over the top, it is utterly irresistible. Butter a 1.2 litre pudding basin. Place all the pudding ingredients, except the walnut pieces, in a large bowl and whisk together with an electric hand whisk until the mixture is smooth and combined. Pour the mixture into the pudding basin and level the top. Make a double foil square, about 23cm, and generously butter one side. Make a pleat in the middle to allow room for the pudding to expand, place over the top of the pudding and fold in the edges to seal tightly. 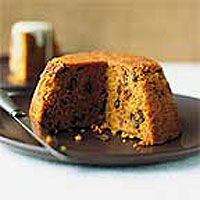 Place the pudding in a large deep pan and fill with enough boiling water to come halfway up the side of the basin. Cover with a lid, bring to the boil then simmer over a low heat for about 2 hours, or until firm and well risen. Add more water to the pan if necessary to make sure it doesn't boil dry. Meanwhile, to make the sauce, mix the mascarpone with the icing sugar and vanilla extract in a bowl until smooth, then chill until needed. Carefully remove the pudding from the pan and leave to stand for about 5 minutes. Remove the foil, loosen the edges of the pudding with a round bladed knife and turn out onto a serving plate. Serve slices of hot pudding with spoonfuls of vanilla mascarpone melting over the top.